The black woman displayed on the door is just one of Davis’ ways of teaching and honoring Black History month where she teaches at Lake Alfred Elementary. LAKE ALFRED, Fla. — Walking into Ms. Davis’ classroom you’ll notice splashes of color everywhere. Loud, bright shapes, lines of neon and portraits of people that pop into the art teachers head. Beautiful is one way to describe it, and another way to describe her way of teaching. 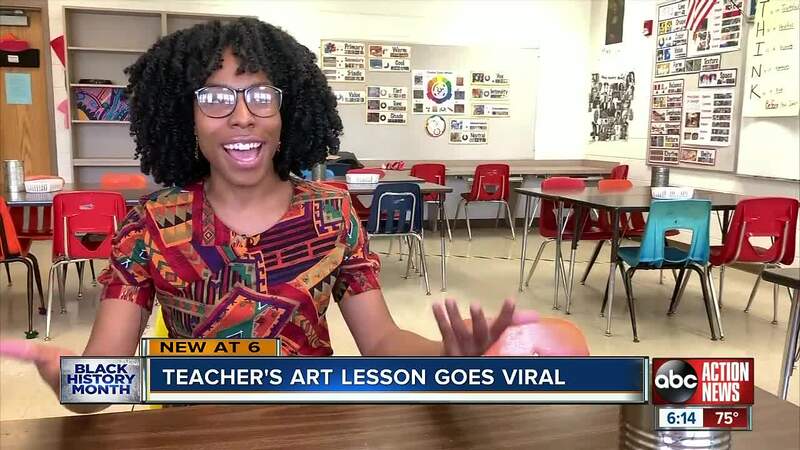 "I am the art teacher of the entire school and the children love art so they have a lot of fun in this classroom," Davis said. But she doesn’t keep her lesson plans limited to inside the classroom. Walking through Chanique Davis’ classroom door it’s not possible to miss the beautiful, curly-haired woman decorating the entrance. Davis says she doesn’t have a name, but says she a queen. It's her way to pay homage to natural hair, especially dreadlocks. This lesson was important to show her students, as Davis says it's not commonly accepted to wear dreadlocks in the corporate world. "It’s a style that should be celebrated, it’s diversity and even hairstyles, it should be appreciated," she said. Davis posted an image of her door from 2019, as well as a past version of her Black History Month door from 2018. Both got likes from across the country. The Instagram post has been liked by more than 2,600 users. It even gained exposure on PopSugar and Good Morning America. "Lake Alfred Elementary teaching the world ," Davis said. Chanique Davis is also an independent artist. Follow her work on instagram at @TakaChanique.